We live in uncertain times. As the human population grows, the variety of life declines, ice caps shrink, and our Earth system behaves in ways its species have never experienced. The past no longer provides us with a guide to how the future will behave, and we search for solutions while moving into an increasingly uncertain space. In such a time, resilience science provides important insights to help communities engage with the complex set of challenges they need to navigate. Resilience scientists define resilience as the capacity of a system to absorb disturbance and reorganize so as to retain essentially the same function, structure, and feedbacks; that is, it is to have the same “identity.” Put simply, resilience is the ability to cope with shocks and keep functioning in much the same kind of way as before. There is no single measurement or number that captures resilience; rather, it is underpinned by a suite of attributes. The important point is that resilience thinking is a form of systems thinking. To understand, assess, and manage resilience requires a capacity to engage with the system. It requires the ability to—in one way or another—describe the identity of the system, how that identity might be changing over time, and what threatens that identity. Systems are made up of many interacting parts, and the systems in which humans are most interested (families, communities, cities, catchments, regions and nations, etc.) are self-organizing systems. The real value of resilience thinking is that it gives us a way to engage with this complexity. Resilience is not about keeping the system exactly the same; it is not about not changing. Rather, it is about enabling the system to adapt around shocks and disturbances, to self-organize such that the system’s identity is sustained. Trying to hold a system in a state that optimizes the supply of goods and services is tantamount to attempting to simplify its complexity. The consequence is that the system’s ability to reorganize in response to disturbances or new conditions that might arise is constrained, and it loses its resilience. The most important insights arising from resilience thinking in regard to the system in which you have a stake will only become clear to you when you apply the thinking yourself. Some insights will be in accord with what resilience thinking suggests, but some will come as a complete surprise, for that is the nature of complex systems. 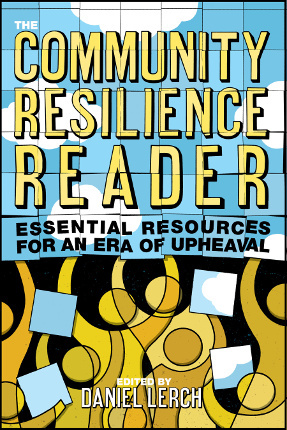 This post is based on a chapter from Post Carbon Institute’s 2016 book The Community Resilience Reader: Essential Resources for an Era of Upheaval.